Owners are also often distressed by other behaviour such as jumping up, begging for food, jumping on furniture, over-protectiveness and escaping , but often feel that this sort of "bad" behaviour is not worth bothering the vet with. However, any behaviour problem that causes inconvenience, concern or embarrassment to the owner can be defined as a behaviour problem, and as these issues can also be a symptom of an underlying psychological problem, they should be taken seriously for the dog's sake. Behaviour problems are frequently the result of a dog's experience in early life. Inadequate socialisation and lack of exposure to experiences as a puppy means that a dog will have difficulties forming normal relationships later in life, and may develop fear or aggression problems. Because dogs are social animals, they naturally form close bonds with the other animals and people with whom they live. Disruption of these bonds due to repeated re-homing, upheaval or death of a family member can result in attachment disorders such as separation anxiety or over protectiveness. Dogs have a complex communication system, involving posture, facial expression, vocal sounds and scent. In some breeds, the dogs' physical characteristics prevent them from clearly signalling to other dogs, which can give rise to communication problems, and may result in fear / aggression towards other dogs. Similar problems arise if signals such as growling are punished by owners, as this encourages the dog to skip this warning stage in its aggressive display. Dogs learn very quickly, so a single traumatic incident can trigger fear or phobia, which manifest as anxiety, attempts to escape or aggression. Seemingly random fears can develop if a dog associates a frightening event with a sound, object or person that happened to be present at the same time. In some cases, the natural behaviour of the dog becomes a problem. Some breeds are predisposed to exhibit particular behaviour traits, such as territorial behaviour or chasing. This can give rise to problems if the dog displays the behaviour inappropriately. I treat behaviour problems in dogs using reward-based methods; I do not use any form of punishment. Punishment is never appropriate, as it may cause the dog anxiety or fear, which inhibit learning and disrupt therapy, and it can exacerbate the problem - in aggression cases punishment is highly dangerous. I carry out a detailed consultation in order to accurately diagnose the underlying causes of the behaviour. Using proven behaviour modification techniques, I work with owners to develop a treatment plan that addresses the causes rather than the symptoms; the behaviour improves as a result. Many owners are concerned about the effect behaviour therapy will have on their relationship with their dog. Far from damaging the bond, owners find that carrying out a treatment programme promotes a strong, healthy relationship. If your dog is exhibiting any behaviour that gives you cause for concern, please see your vet to rule out medical causes and to request a behavioural referral, then contact me to make an appointment. 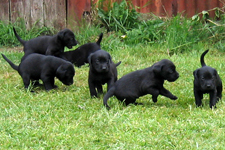 In dogs, the socialisation period begins at about four weeks, when puppies begin exploring. Between four and twelve weeks is the optimum age for puppies to learn how to interact with other animals including people. Exposure to a diverse range of stimuli at this time will encourage the puppy to be confident and investigate novel objects later on, and helps to prevent fearful behaviour. My puppy classes provide puppies with the opportunity to meet other dogs, play in a safe environment and encounter a variety of new and interesting objects. I also provide some basic training and behaviour advice. While the socialisation period is the optimum time for introducing a puppy to the world, learning continues throughout life, so even a poorly socialised dog can be helped with behaviour counselling. It is never too late to help your pet, and I'm always happy to hear from you and to talk about any concerns you have, so please don't hesitate to contact me.